Fans of alternative router distro DD-WRT have long enjoyed slapping it onto every router they could buy that would let them. Linksys and NETGEAR realized this awhile ago and produced routers designed specifically for this purpose. I was surprised to see the Linksys WRT54GL still available from many etailers as well as the WRT160NL. And NETGEAR's WNR3500L still seems to be going strong with a whole website devoted to it and other DD-WRT-able NETGEAR routers. Buffalo decided to embrace DD-WRT even more closely and has been shipping its wireless routers with it installed since early 2010. The last time we checked out a DD-WRT based Buffalo router (the WZR-HP-AG300H) back in 2011) it didn't go so well. Because the router would not hold 40 MHz mode so that I could run my tests, I ended up falling back to the "user friendly" Buffalo-based firmware. 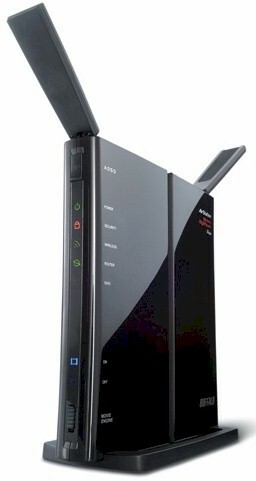 Buffalo has recently slimmed down its wireless router lineup to five single-band and two dual-band models. All but the draft 802.11ac based WZR-D1800H AirStation ship with DD-WRT as the standard firmware load. So we decided to revisit DD-WRT on Buffalo and review a few of its new offerings. The WZR-300HP that is the subject of this review is the penultimate model in its 2.4 GHz line. Looking at it, you could get a definite déjà vu because it appears to be identical to the aforementioned WZR-HP-AG300H. It's not the same beastie, however, since the AG300H is dual-band. Both routers share the same glossy black fingerprint-magnet plastic slab package designed to stand vertically on your desk or shelf like a mini-monolith. But if vertical is not your cup of tea, just snap off (or don't snap on) the included stand and it can also lay horizontally or be wall/ceiling mounted courtesy of two screw slots on its bottom cover. For best cooling, though, I'd go with the vertical orientation. Front panel controls and lights are shown in the callout diagram below. All the indicators you'd want are there as backlit icons. The rear panel ports and switches are shown below and include a USB 2.0 port for storage and printer sharing. Note that all Ethernet ports have link/activity LEDs. The WZR-300HP has Gigabit WAN and LAN ports. If you'd like to save a little dough and have your router run a bit cooler, you can opt for Buffalo's WHR-300HP instead. The 300HP's FCC photos were little help for component identification, but Buffalo helpfully came through with the details. The 300HP's key components are summarized in Table 1 along with its predecessor, the WZR-HP-G300NH. The two products not only look alike, but both are based on Atheros designs. For your comparison pleasure, here's an FCC shot of the WZR-HP-G300NH's board. Note that both routers come with RF shields (removed for the photos), but no heatsinks. The two smaller black specs up near the radio chips on both boards are outboard power amplifiers. The photos aren't detailed enough for a positive ID, though.